Cenbo Village is a small rural community located a few kilometers south of Dianshan Lake in the middle of forest wetlands. Cenbo is part of Jinze Water Town, a municipality of Shanghai’s Qingpu district with more than 900 years of history and related architecture monuments. Its location – only 60km from Shanghai Ppl Sq - makes it an ideal starting point for exploring nature on weekends or even for a single afternoon. 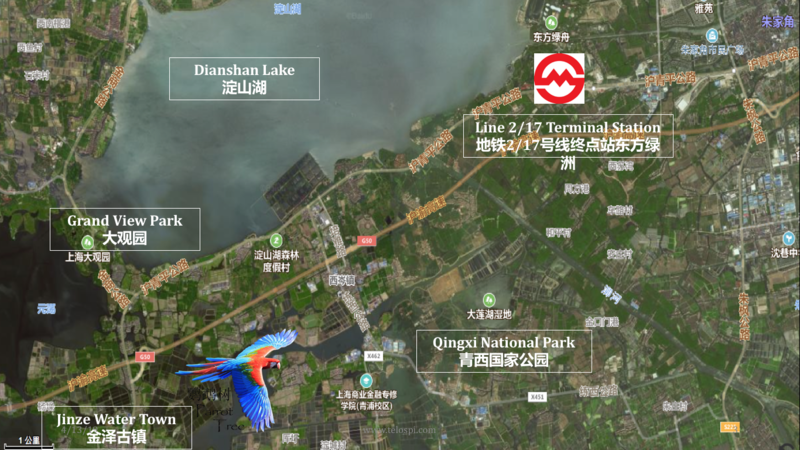 Dianshan Lake is Shanghai's largest freshwater reservoir and the source of Huangpu River, the mother river of Shanghai. It covers an area of 62 square kilometers (24 square miles) and is surrounded by a web of canals and smaller lakes which all form part of the Yangtze River Delta. An express bus [沪商高速专线] - which can be conveniently found on baidu maps if you can read and type Chinese - leaves close to People Square from Danshui Rd／Changle Rd ［淡水／长乐路］with one additional stop at Yanan Middle Rd / Shimenyi Rd [延安中／石门一路]。Get off in Jinze Town [金泽镇] after a 60-80’ ride and contact one of the local drivers to take you to Cenbo Village (CNY 30) once you are on the bus. Alternatively jump on line 2 and interchange at Hongqiao Airport to line 17. Get off at Dongfang Lvzhou [东方绿洲] and contact one of the local drivers once you are on line 17 to pick you up from the terminal station (CNY 60). Take G318 in Western direction. While the first 2/3 of this 60km ride is a concrete jungle odyssey, the last third rewards with pleasant views of Dianshan Lake. Additional routes will be posted on the activity section as time unfolds. Enter 220 Cenbo Road [岑卜路220号] into your navigation system and take Yanan Elevated Highway out of town and exit G50 at Xicen [西岑]. From there it’s another three km to Cenbo Village [岑卜村]. There is no parking in front of the house, so park your car opposite of the village council［村委会］on the basketball ground which has been turned into a parking lot.